Choosing an auction company should based on the company's integrity and stability along with expert level knowledge as this is one of the most important business descisions a consumer will make. 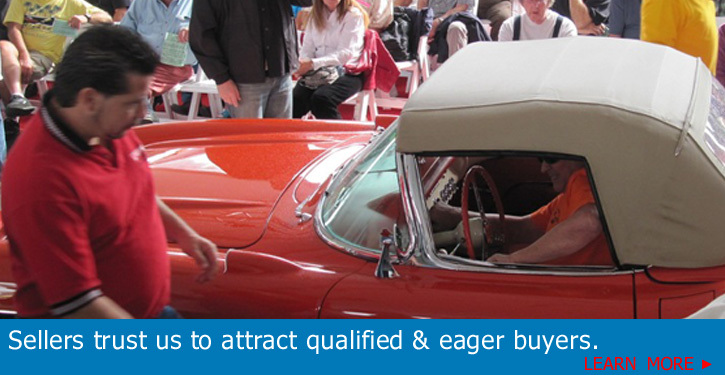 We have been producing classic car auctions in Palm Springs for 33 years! We are a family owned and operated Classic Car Auction house based in Palm Springs, California. We produce 2 large Classic Car Auctions per year here in Palm Springs. The auctions are open to the general public and dealers are also welcome. Each event features over 500 Classic & Exotic cars. The events are held in February & November each year. The venue is The Palm Springs Convention Centers Outdoor Special Event area in downtown Palm Springs, just steps away from many resorts, shopping and fine dining. We also have a very busy year round classic car showroom here in the heart of downtown Palm Springs with many classics for sale on a daily basis. Back in 1981, Keith McCormick had already become a successful entrepreneur in his native United Kingdom, but he longed to realize a dream to move to Palm Springs, California and devote his time entirely to his family...and his cars. In 1985, Keith hosted his very first exotic car auction. A modest affair, by today's standards, but one that would start a tradition. Today, Keith's relentless dedication to excellence and integrity has produced one of the most prestigious, respected, and successful car auctions in America.